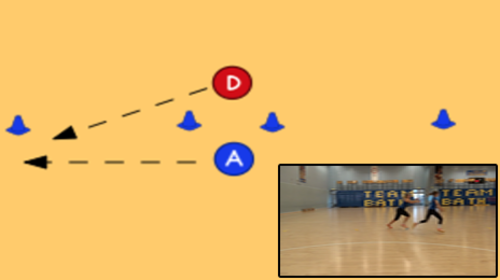 Partners work facing opposite each other, 1 attacker and 1 defender, starting in the 2m zone in the middle. The attacker has to lose the defender within the 2m zone, by dodging and feigning, and then run to either of the outer markers 4m away at the left or right. The defender's job is to tag the attacker before they make it to an outside marker.